Mr. Christopoul is a Co-Founder and Managing Partner of 54 Madison Capital. Prior to founding 54 Madison, Mr. Christopoul was Senior Partner and Head of Real Estate Investment for Cain Hoy Enterprises, an affiliate of Guggenheim Partners, LLC (“Guggenheim”) where he was Senior Managing Director of Global Real Estate and Infrastructure. 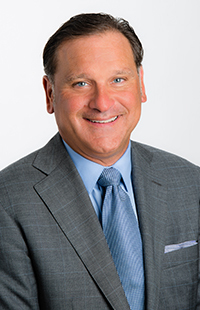 Prior to joining Guggenheim he was Chairman and Executive Director of GPS Industries, LLC – the leader in the development and distribution of cart-mounted GPS technology for the global golf industry and was Chairman of Rita’s Water Ice Franchise Company – the world’s largest ice and custard franchisor. Both units are controlled portfolio companies of Falconhead Capital – a middle market private equity firm where Mr. Christopoul served as an Operating Partner. Mr. Christopoul also served as President and Chief Executive Officer of Resources Global Professionals; a multinational consulting services firm (NASDAQ: RECN). Before being named CEO in 2007, he served as an independent member on the Resources Board of Directors. Mr. Christopoul previously worked for more than a decade at Cendant Corporation with Mr. Silverman where he served as Chairman and Chief Executive Officer of the Marketing Services and Chairman and CEO of the Financial Services Division, where he managed Jackson-Hewitt Tax Services, the second largest tax preparation firm in North America. He also served as Senior Executive Vice President and Chief Administrative Officer at Cendant where he led the corporate and staff functions of the company on a global basis. He worked for several years prior to Cendant at PepsiCo and Nabisco Brands. Mr. Christopoul holds a Bachelor of Arts degree from Rutgers University and a Master of Science degree from Purdue University, where he is a distinguished alumnus and serves on the University’s Advisory Council. He is also currently a member of the board of directors of Apollo Residential Mortgage, Inc. (NYSE: AMTG) and of Rexnord Corporation (NYSE: RXN).